The recently passed away French architect Jean-Philippe Zoppini had a vision that went further than the much discussed Norwegian Epic: L’ille AZ. 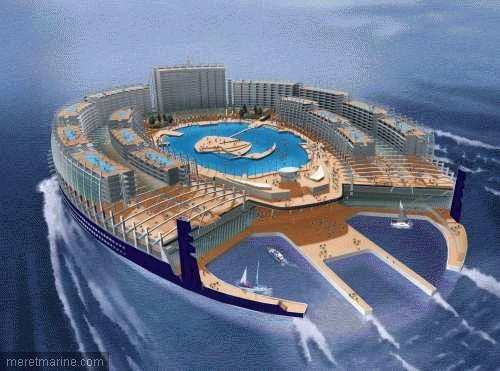 An ambitious futuristic project for a high-tech, artificial island capable of movement. She was bound to be 400 m long and 300 m wide, 29 floors (decks??) high and a surface area 0f 450 000 m2. Oh dear……that would be quit large! 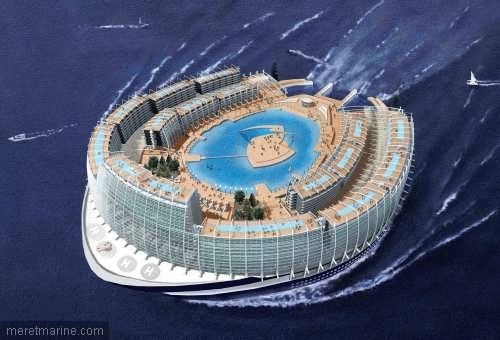 She would habitat 10.000 passengers and slowly, max 10 knots move around the world. Offcourse every port on the world would be too small for her so she is equipped with helicopter landing platforms and her own marina. I don’t know if these monstrous large floating islands (can’t call them ships anymore) will ever roam our world but for the moment I think this is just too big for us. they had to try hard to find something uglier than the floating apartment building that Carnival is building. If this is any more practical (or less lawsuit worthy) than the worldship I will be very very surprised. no! this is great! we can now shovel everything in the Great Pacific Garbage Patch into her basement. Please proceed to 140°W, 35°N. Thank you so much.